It’s grilling season! Let’s talk all about chimichurri sauce. Chimichurri is a bold and refreshing herbed sauce hailing from Argentina. 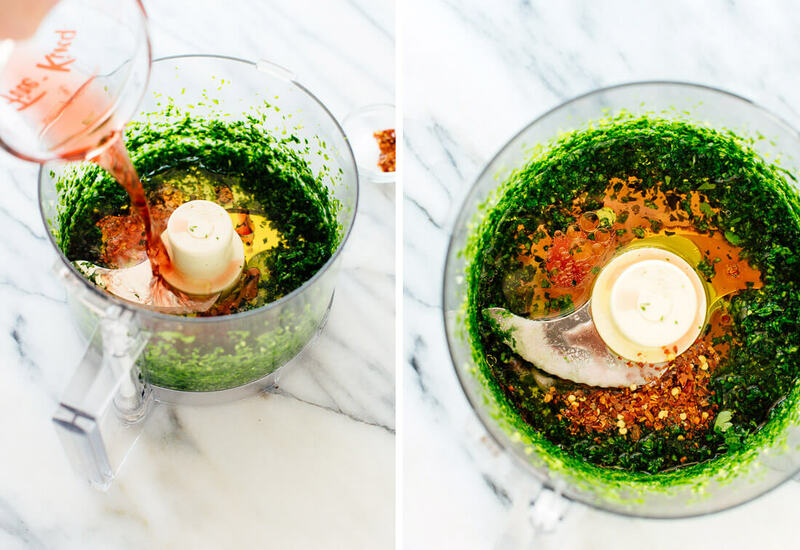 There are two kinds of chimichurri sauce, green and red. This recipe is for the more common green variety (chimichurri verde). 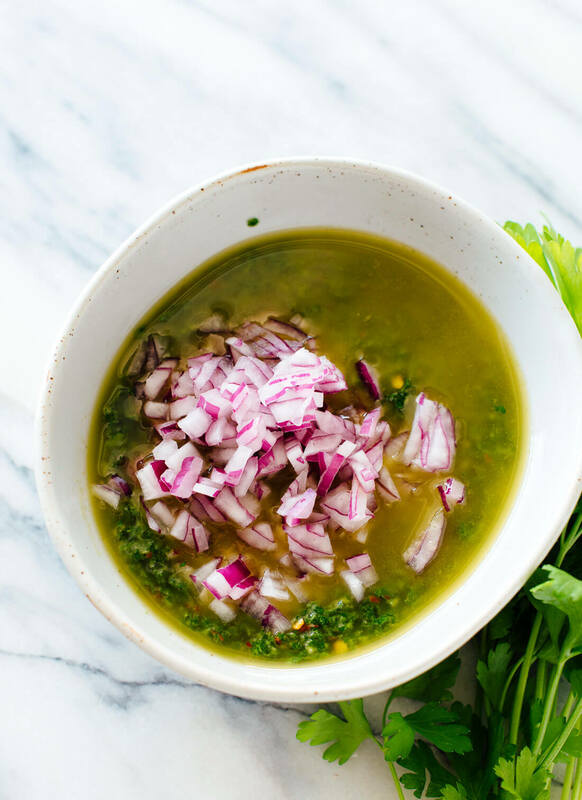 Authentic chimichurri verde is made with parsley, garlic, red onion, red pepper flakes, red wine vinegar, and olive oil. These simple ingredients yield a spectacularly delicious green sauce. 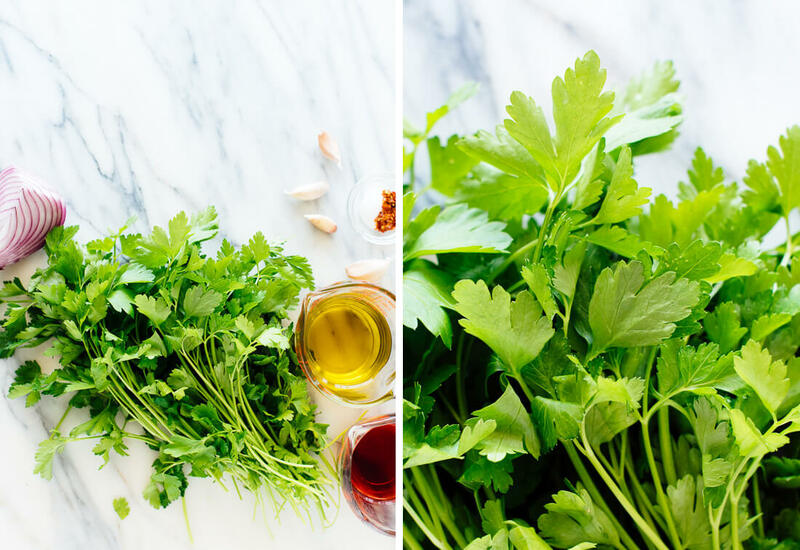 Some chimichurri recipes call for fresh cilantro in addition to parsley. However, several Argentineans have told me that they don’t actually add cilantro in Argentina. I took their word for it and made my chimichurri sauce with just parsley. You’ll also see some recipes with oregano, whether fresh or dried; I like it better without. Chimichurri verde is typically served on steak in Argentina and throughout South America. It’s not just for steak, though. Chimichurri sauce brightens up smoky grilled vegetables. It also goes great with mushrooms, carrots, and potatoes, no matter how they’re prepared. I love chimichurri on scrambled or fried eggs, too, and whole grains like brown or wild rice, farro and quinoa. I think it might even be nice as a salad dressing or on grilled corn on the cob. Chimichurri is so quick and easy to make! I love how my chimichurri turns out after a whirl in my food processor. Traditionally, chimichurri is made by hand in a mortar and pestle. I don’t have the patience or the time to make it by hand, and I think you’ll be thrilled with the results if you make it in a food processor as directed in the recipe below. 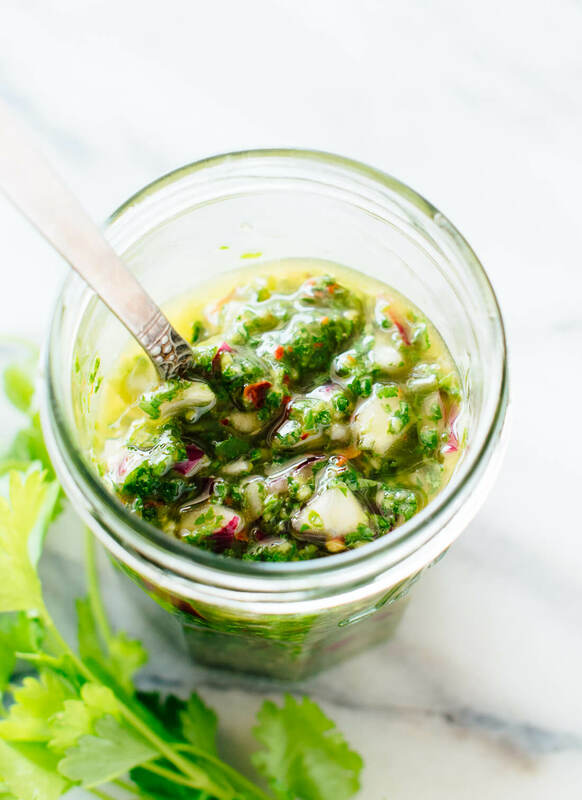 Please let me know how you put this delicious chimichurri recipe to use! I love to hear from you in the comments. For more fresh, herbed sauces, don’t miss my recipes for basil pesto, tzatziki and shatta (herbed jalapeño hot sauce). 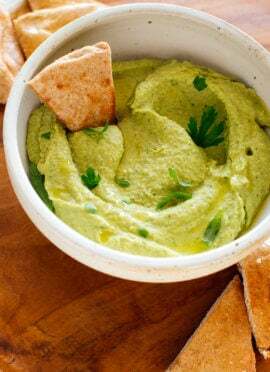 You might also enjoy my favorite guacamole and green goddess hummus! You’ll love this traditional chimichurri recipe! Chimichurri verde is a popular parsley sauce in Argentina with bold, fresh flavor. It’s easy to make, too. Recipe yields 1 cup. 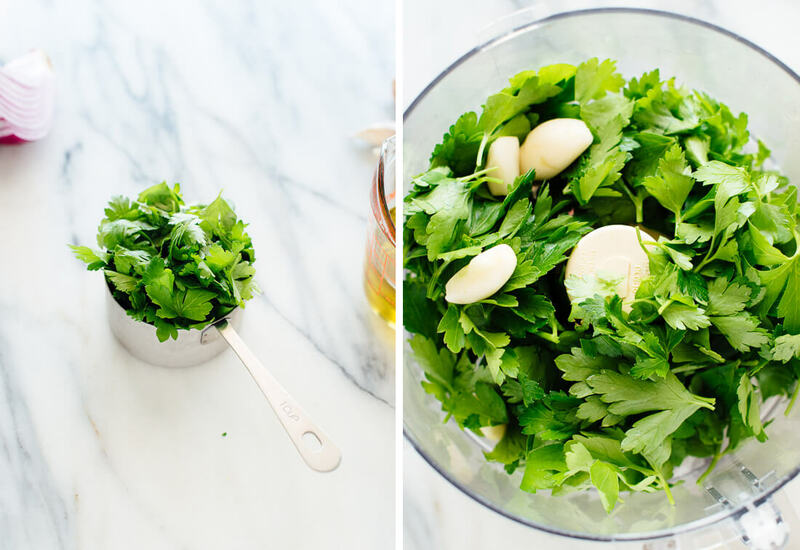 In a small food processor, combine the parsley and garlic. Process until finely chopped, stopping to scrape down the sides as necessary. Add the olive oil, vinegar, salt and red pepper flakes to the food processor (don’t add the onion just yet). Process briefly to combine. Transfer the mixture to a small jar or bowl and whisk in the red onion until the mixture is well blended. Let the sauce rest for 10 minutes to allow the flavors to meld. Taste, and if necessary, add additional salt (sometimes I add another ¼ teaspoon) and/or red pepper flakes (for more heat). The sauce tastes best when served fresh, but it keeps well, covered and refrigerated, for 3 to 4 days. To prevent the sauce from turning a darker color (which doesn’t affect flavor), press plastic wrap directly against the surface before storing. If the olive oil solidifies in the refrigerator, don’t worry—let it warm up for 5 to 10 minutes at room temperature and then whisk to recombine. Recipe adapted from The Complete America’s Test Kitchen Cookbook and Food and Wine. Food processor notes: If you don’t have a food processor, you can finely chop the parsley (the finer, the better) and press or mince the garlic. Whisk the olive oil and vinegar together in a bowl until blended, then add the remaining ingredients and whisk again! Yum–that sounds delicious, Corinne! I’m so glad they paired together well. Yum! this looks so good. I bet it’d be delicious on some grilled veggies – perfect for summer! Also, CONGRATS on the best cookbooks list! Thanks so much, Aimee! I hope you try the chimichurri, too. Hooray on “the best” ! I’m not surprised about this :D . You’ve created such a helpful and inspiring book! And chimichuri? Sublime! I usually throw cilantro in mine, but I’ll take note from the Argentineans. Now, about those cookies… we took them with us to Olympic National Park this past weekend. Although they didn’t last long, we loved soothing our sweet tooth after a few rigorous hikes! Thank you Kate! And congratulations!! Thanks so much, Traci! I’m glad you had the cookies to keep you going. Those hikes must have been beautiful! Chimichurri aka, best condiment/sauce everrrr!! Love this and the color is epic. I love the color, too. So vibrant! I love chimichurri! Actually mix it with hummus. Haha. Yes, it’s good! And I have seen your gorgeous cookbook recipes everywhere! Congrats! I definitely need to check it out. Thank you so much, Lindsay! I hope you check out the book. 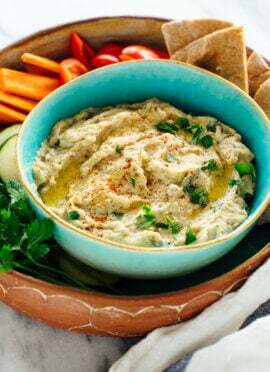 And I’ll have to try the chimichurri+hummus combo… do you just eat it like a dip, with pita chips, or as a topping? I am not surprised at all about your book- your Vegan Kale Cesar Salad is already a family favorite! This chimichurri sauce looks like I want to pretty much put it on EVERYTHING! Yum! Aww, so kind! I’m so glad everyone loves the kale Caesar. I hope you try the chimichurri! This is SO PRETTY! I want to add this sauce to everything this Summer! Also congrats on your cookbook success! So amazing!! Thank you, Lexi! I’m with you on saucing it up this summer, too. I have so much experimenting to do! Looks delicious! I enjoy your website and am looking forward to trying this out this weekend! I had no idea you had a cookbook out. Nice! Yes, it came out on May 16! I hope you check it out. My past couple of posts include links to recipes from the book that my friends + fellow bloggers made–I hope you look through those, too! Thank you, Jeanine! You’re the best. I’ve always wondered what chimichurri sauce was made out of but never got around to looking it up, so easy! Love it! Right? 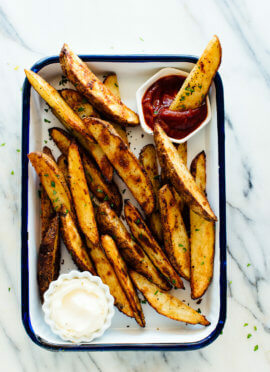 So simple and so delicious. You’re welcome, John! I hope you try it. Thanks so much, Erin! I hope you try the chimichurri. Your cookbook is amazing! I have enjoyed your recipes online for a year and couldn’t wait to order your book. The Chimichurri made my assortment of veggies (potatoes, carrots, squash, green pepper, onions) tasty. The next day I used the left-over vegetables with more Chimichurri in a soup with a milk base. I love the possibilities of the Chimichurri as the left-over sauce can make almost anything better. Tomorrow, I am going to put what I have left in some breakfat eggs. Last night I made the Peanut Butter Chocolate Chip Cookies to freeze and take to a party with some vanillla ice cream. Freezing them was a good ideato prevent me from consuming all of them. I used the 60% chocolate chips which I strongly recommend.The cookie scoop needed to be packed to keep the cookie together when baking. Unfortunately, we do not have a dog, but my husband is most happy to eat all that I cook from your recipes. Love the basil recipe suggestions! Thank you so much for kind words about my book! I worked SO hard on it, so that really means a lot. I want to try that chimichurri soup! Hands down the best cookbook ever! I didn’t have vinegar so used lemon juice…also added cilantro! Perfection on grilled portobellos & baby potatoes! Thank-you for sharing your passion with us! Thanks so much, Lindsay! I’m happy you love the book and the chimichurri. 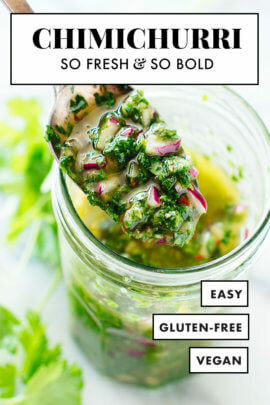 I love bold sauces like this, and I’m really happy you left out the cilantro – I love it, but my BF says he has that gene that makes it taste like soap, he hates it and is able to detect the littlest sliver in a dish (yes, I’ve tested this since I refused to accept I really had to leave the cilantro out…). But your version is one we can enjoy both, with a steak for him (even though I don’t eat meat anymore, I still can only admire the brilliant combination that is almost raw steak with a bold flavoured sauce like chimichurri), and grilled portobello mushroom for me. Thanks for the recipe! Thanks so much, Evelyn! That’s hilarious about your boyfriend’s cilantro-smelling skills. I’m glad the two of you ended up liking the chimichurri! Any plans for a U.K./European version of the cookbook with weights rather than cups etc? I think it looks beautiful but converting everything is too much hassle! Hi, Rosalyn. I’m so sorry to hear that you’re disappointed by the measurements. Incorporating metric measurements isn’t as easy as it seems; it’s an extra layer of complexity, effort and length (some of the recipes’ ingredients lists already spill over to another page). And, it adds more room for human error. I hope to start offering metric measurements on the blog someday when technology makes it a little easier to do so. I think the German version of the book will include metric measurements, but I’m not sure when that will be released. In the meantime, measuring cups are inexpensive and seem to be available cheaply on Amazon in other countries. Hope that helps! YAY! Congrats on the book doing so well. I mean, I’m not surprised. It’s a gem! Great news to carry you into the long Holiday weekend! Chimichurri sauce is a favorite of mine. I might even like it more than traditional pesto (GAH!). It’s so flavorful and good on everything in the Summer! Thank you, Liz! I’m so excited about the book. I hope you try the chimichurri! You’re right about the cilantro. I lived in Argentina and they don’t use it at all. We had to grow our own. Aha! That makes sense. Thanks, Richard. 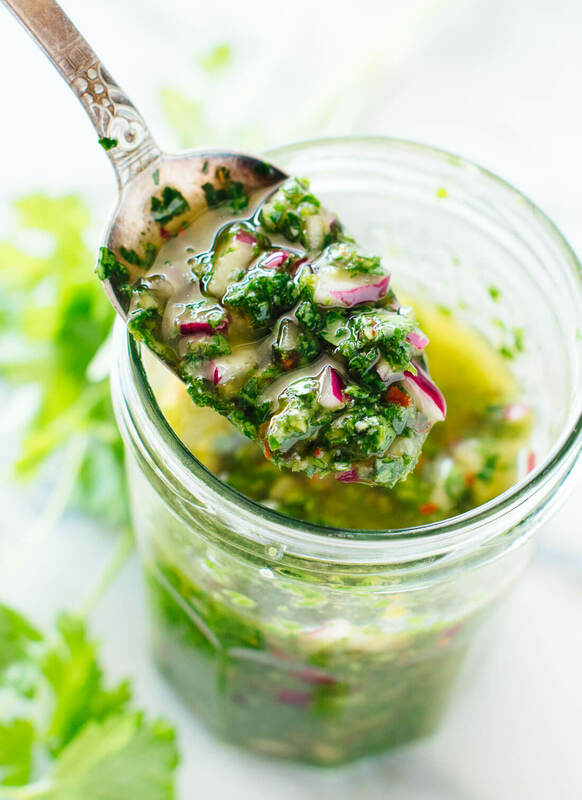 This chimichurri looks delicious – and so versatile! Can’t wait to have a go this weekend. Also, congratulations on the new book! What’s the availability for your Australian fans? Thank you, Paula! I hope you love the chimichurri. Right now, Love Real Food is available in Australia only in the Kindle version. I’ll update if anything changes! I use grapeseed or canola oil as olive oil separates when refrigerated. I use white wine vinegar as opposed to red, I do not use the red onion and instead use a hot mustard. Red pepper only if I want heat but usually not. My fatherinlaw taught me this and it never lasts long as we could drink it, it so good. Your version sounds delicious, Patrice. Many thanks for adapting the recipe for those of us who do not have all the kitchen machines etc. All I have is a stick blender as I have the tiniest kitchen ever and do not have the resources for buying all the stuff I see listed in must have kitchen appliances. Many thanks for adapting the recipe for those of us without all the kitchen must have machines, etc. I’m glad you did! And, you’re welcome. I appreciate the review.